What might humans be like if they grew up in the wild, without guardians or any type of societal norms? Without anyone to guide our developing intellect would we be reduced to animalistic behaviors? These are interesting questions that would fit very well into the horror genre. Mama the 2013 horror film, directed by Andrés Muschietti, introduces these intriguing topics, but unfortunately spends very little time exploring them. The film about two young girls who are found after several years of living alone in the woods, has some thrills, but fails to rise above a muddled storyline. The film opens with a suitably creepy setup. A very young girl hear a gunshot from the bedroom she shares with her baby sister. Her frantic father bursts in, scoops up the girls and speeds away over an icy mountain pass. Eventually the trio winds up in a secluded cabin. 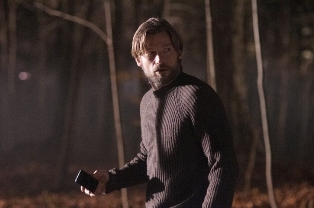 As the father, Jeffrey (Nikolaj Coster-Waldau – who is best known as Jaime Lannister on Game of Thrones), comptemplates what to do next the girl eerily tells him she see’s woman outside, whose feet don’t touch the ground. He pays no attention. We don’t get to see right away what she is talking about. Is it incoherent ramblings of a scared three-year-old, who has just broken her glasses, or is it something we can’t quite imagine? The beginning very effectively sets up a creepy and uncomfortable situation. Since we know the girls are abandoned it’s no secret to say that Jeffrey should have paid more attention to what his daughter was saying. Fast-forward five years, and we find that Jeffrey’s identical twin brother Lucas (Coster-Waldau in a dual-role) has never given up on finding his nieces. He has spent his life savings on a private search team. An d one day, in the most creepy scene of the entire film, the find them. The girls, eight-year-old Victoria (Megan Charpentier) and six-year-old Lilly (Isabelle Nélisse), are completely wild. Lilly especially remembers nothing of civilized life. She knows only a few words and hates to be touched. Victoria, on the other hand, shows some signs that she remembers the life she once had. Instead getting to know how the girls are rehabilitated we once again flash-forward over a year to where they are being released into the custody of their uncle and his wife Annabel (Jessica Chastain). Annabel is a bassist in a punk band, and a very reluctant mother. She even tells the girls to never call her mom. Nevertheless, she agrees to quit her band, move to a new house, and play housewife. Remember the woman whose feet didn’t touch the ground? She was a kind of otherworldly guardian to the girls and she is angry to have been abandoned by them. Apparently she wasn’t around while the girls were institutionalized, but she’s back for vengeance when everyone moves into the new house. From there we get a fairly conventional angry ghost story. It’s unfortunate because so much more could have been done with the story. The lead performances are all good. Chastain particularly stands out as Annabel. Annabel is not always likeable, but she seems genuine as she slowly warms up to her new responsibilities. The young actresses playing the two sisters also do a good job of seeming natural, especially since they do not really get to act like normal children. So, the story starts out pretty good, but by the end I found myself losing interest. And without spoiling anything, I’ll just say that I thought the end was totally lame. I have no complaints about the Blu-ray itself. The picture and sound are great. The special features are decent. There is an audio commentary from director, and co-writer, Muschietti and his sister Barbara, who co-wrote and produced the film. There is also a couple of EPK type pieces and about eight minutes of deleted scenes. The best feature I thought was the original short the film was based on. The short is recreated for a scene in the film, and it was interesting to see how similar they were. It was also interesting to find out what had sparked the interest of executive producer Guillermo del Toro. 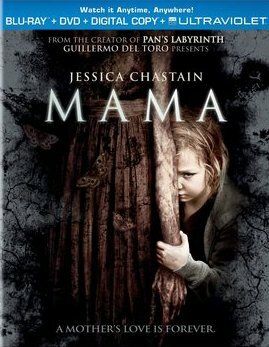 Overall, Mama was a disappointment, though it is definitely watchable. The film is boosted by the presence of Jessica Chastain, and as a Game of Thrones fan I liked seeing Coster-Waldau in a different role. So, I’ll say this one is not great, but okay. I’ll give it a marginal recommendation. I love horror films and wanted to see this in the theatre. Guess I’ll catch it on dvd. When I first saw the trailer, I didn’t even recognize Jessica Chastain. Although it sounds like a one-timer, I’m going to seek it out anyway. Here’s an idea…how about give this away as a double feature with Jodie Foster’s “Nell?” Same type premise, totally different films, right?